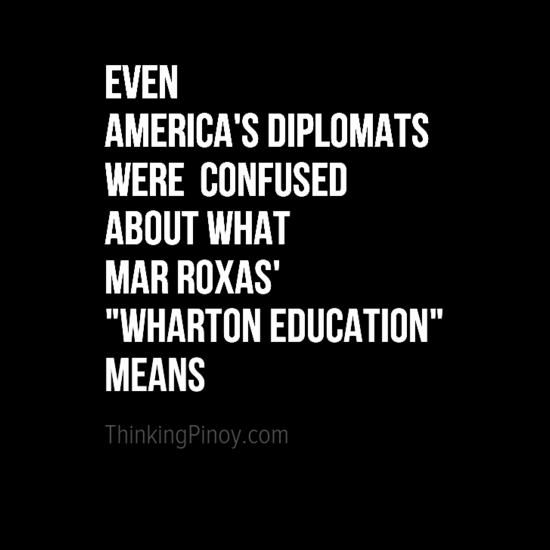 Was Mar’s way of describing his educational background confusing? A source suggests it is. There’s a raging online debate about the right way his words should be interpreted. Judging from readers comments and tweets from pro-Admin personalities, it appears that Roxas’ supporters insist that Roxas was honest about it. They say that the use those words do not really sow confusion. It’s just that many Filipinos are unfamiliar with Wharton jargon. Mar's "Background" in Economics: From Age 7 to 22. Did Roxas really sow confusion with his vague statements about his education? Was it an honest mistake? 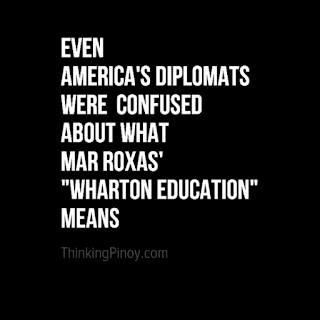 The answer usually depends on which side you're on, but it appears that even America's diplomats were confused about what Mar Roxas' "Wharton education" means. A leaked confidential US Embassy Manila telegram entitled “Ambassador Continues Dialogue with Presidential Hopeful Senator Manuel ‘Mar’ Roxas”, details a 2008 private meeting between then-Senator Mar Roxas and US Ambassador to Manila Kristie Kenney. 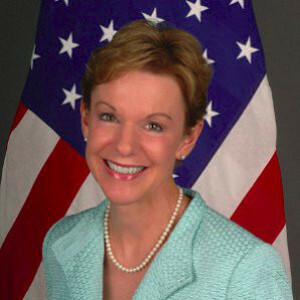 Kristie Kenney, US Ambassador to Manila from 2005 to 2009. According to Kenney, Roxas met with her for a private breakfast to discuss the Roxas’ 2010 presidential ambitions, among other things. 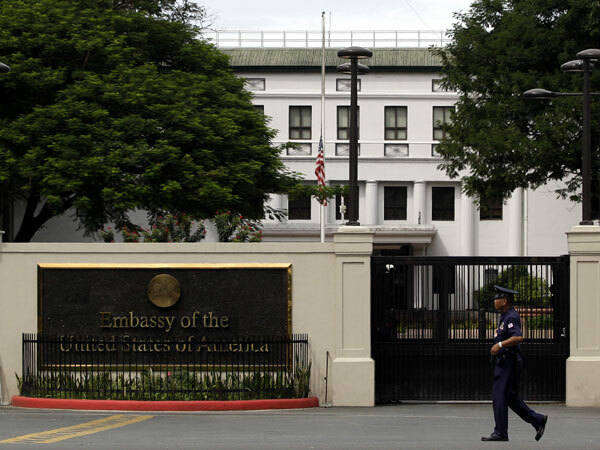 “Roxas confided to the Ambassador that he was not sure how he personally would tackle that problem, given that his Wharton MBA and ten years on Wall Street as an investment banker did not ‘exactly call to the common man’,” Kenney wrote, in the third person. On one hand, Kenney thinks Mar has a Wharton MBA. On the other hand, the end notes do not show any information about an MBA. One thing is clear, though: Even Kenney was confused. Now who's fault is it? Surely, it isn't Kenney's. 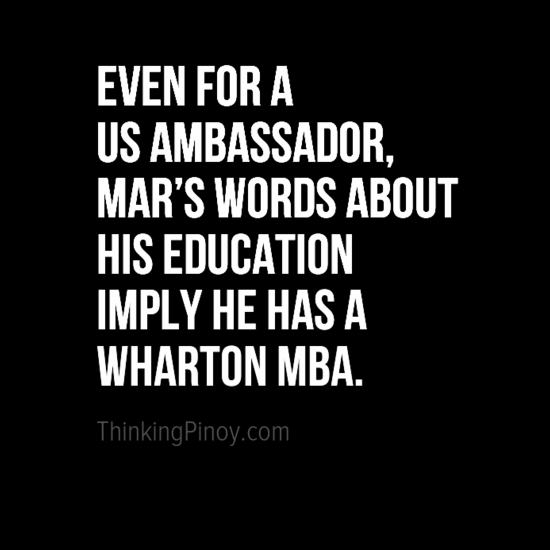 That is, even for a US Ambassador, Mar’s words about his education background imply he has a Wharton MBA. The telegram, written by Kenney, was for dissemination to the US Joint Chiefs of Staff, the US Secretary of Defense, the US Secretary of State, the United States Pacific Command, and the Association of Southeast Asian Nations (ASEAN). 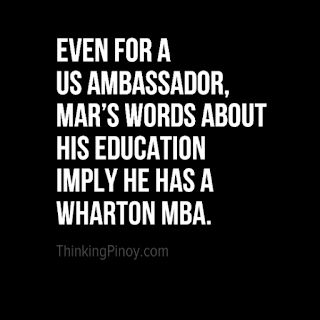 With this US Embassy cable, who among the US Government, the US Military, and the ASEAN actually think that Roxas has a Wharton MBA? Now, as to what “post-graduate studies at the Kennedy School of Government” means, I personally do not care anymore, that’s why I will not pursue the education issue any further. Because this issue is already too ridiculous. 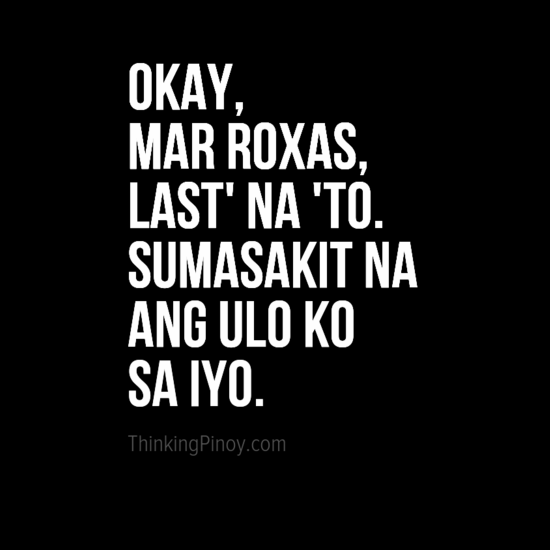 Mar’s communication skills, let alone his real intentions, are already too ridiculous. I really wanted to stop talking about the Mar Roxas’ Wharton MBA brouhaha, because even I agree with a lot of people who say this is a minor issue. But I chose to talk about it one last time, because Mar Roxas is a gift that keeps on giving: the more I learn about the Wharton chismis, the more Mar looks like a joke. 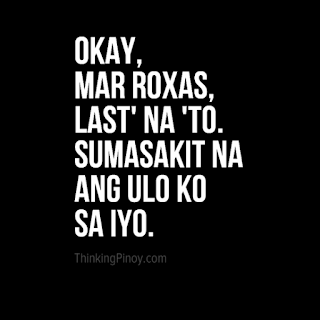 Okay, Mar Roxas, last' na 'to. Sumasakit na ang ulo ko sa iyo.